Infuse your home with the fresh and invigorating scent of Lily of the Valley, which is perfectly captured in the purest natural wax of this tot-sized candle gift set. Refreshing, enlivening and mood-lifting, this Lily of the Valley Candle 3 Tots Gift Set makes it easy to fill your home with the precious fragrance of these wonderful, pure white flowers. Lily of the Valley is one of the world's most beloved floral fragrances, with a sweet and invigorating scent profile that's not dissimilar to jasmine. The iconic scent is derived from the white petals of the Convallaria flower, which stem from a highly poisonous plant grown throughout Europe and Asia. Popular throughout history, Lily of the Valley has come to represent love, purity and innocence, and its clean, green floral fragrance makes it the ideal accompaniment to a tranquil bedroom setting. 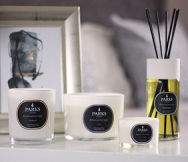 Part of the exclusive Parks Aromatherapy range, a collection of fine fragrances which contain ingredients renowned for their relaxing properties, Lily of the Valley is a bold and energising floral fragrance powerful enough to fill your entire living space with invigorating scent. The floral bouquet of fresh lilies is iconic and enduring, and will help you to set a sophisticated and timeless tone in any room of the home. This luxury Parks Aromatherapy gift set contains 3 tot-sized fragranced candles, each containing 80g of pure natural wax, elegantly fragranced with Lily of the Valley. With a combined burn time of over 60 hours, this beautiful set has the power to fill your home with irresistible scent from the first to last burn.